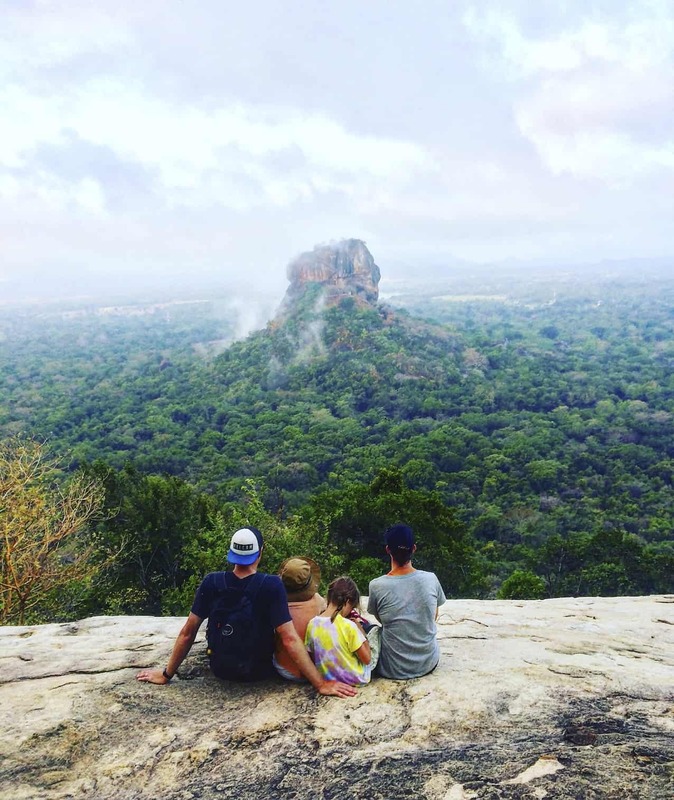 One of the best things we did whilst backpacking Sri Lanka with the kids, was to climb Pidurangala Rock in Sigiriya. Pidurangala Rock is a huge rock formation a few kilometres North of Sigiriya giving outstanding views of Sigiriya’s famous Rock Fortress (Lions Rock). 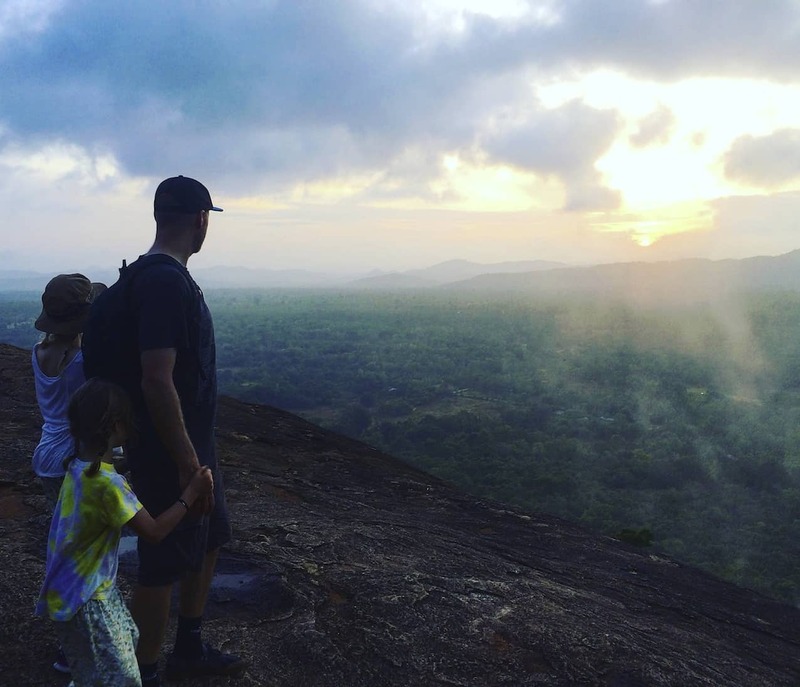 If you want to read our full itinerary for 3 weeks in Sri Lanka with kids, click here. It’s full of costs, accommodation tips and gives you a day by day account of our time in Sri Lanka during August. 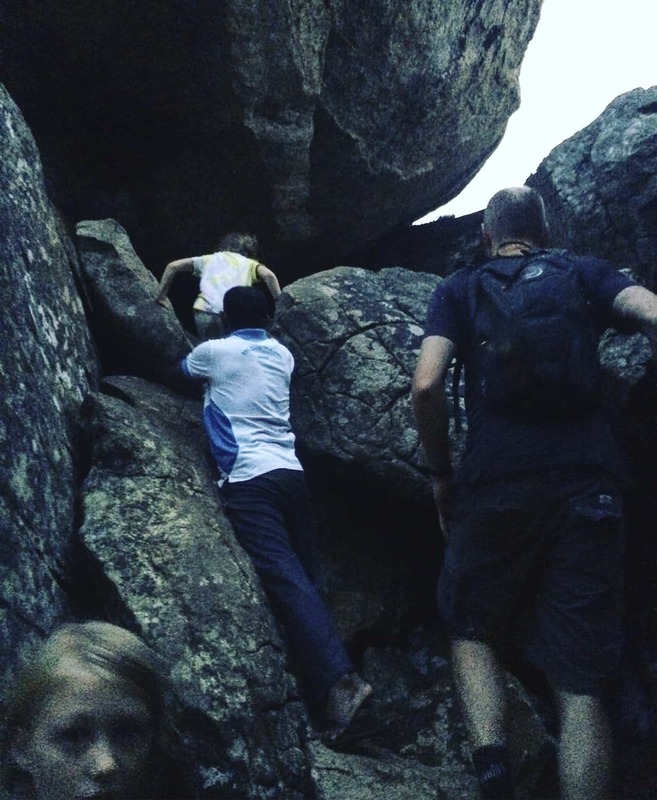 Pidurangala is a much more adventurous climb over the hugely touristy Lions Rock but with only a quarter of the steps and without the crowds, it’s way easier for little legs. With it’s 500 rupee temple donation, Pidurangala Rock is also only a fraction of the hefty entrance fee to Lions Rock. Setting off in the dark at 5am to summit for sunrise and the semi challenging scrabble through and over boulders to summit only adds to the adventure! 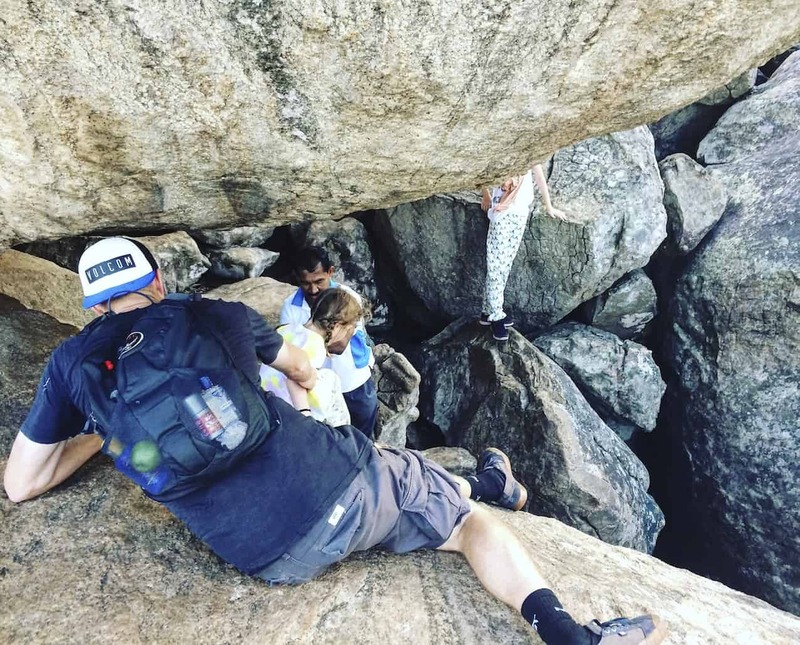 We would definitely recommend anyone visiting Sri Lanka with kids to do this over the more touristy and hugely expensive Lions Rock. 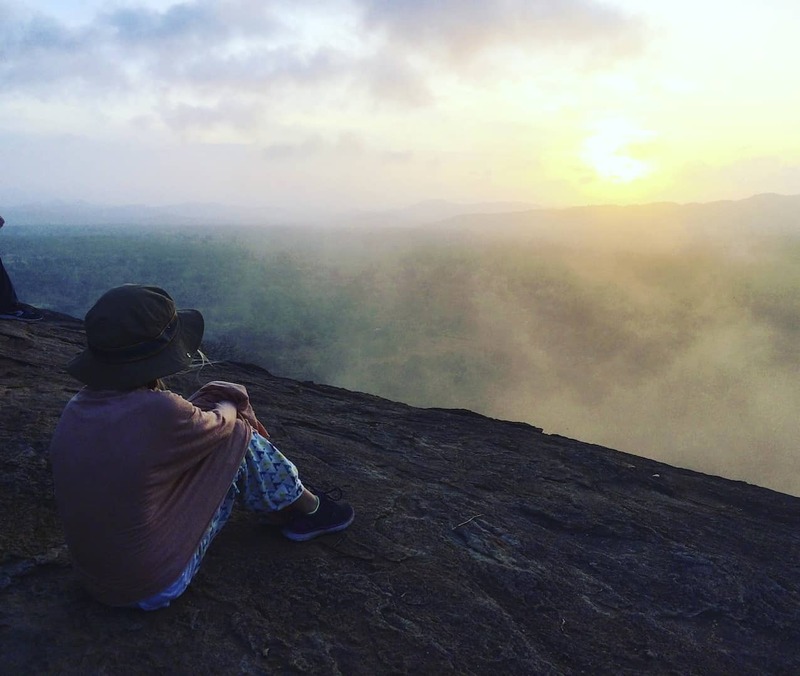 Read on to find out more about our sunrise climb up Pidurangala Rock. 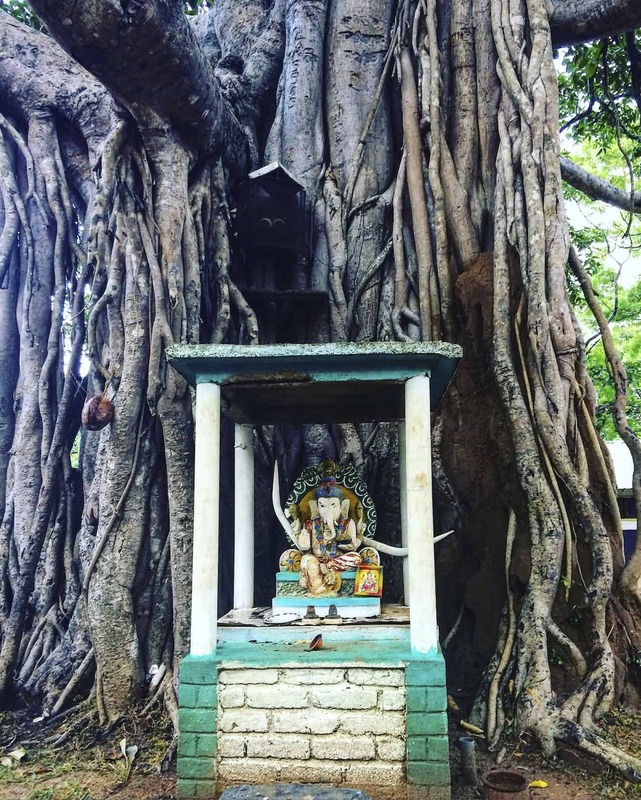 Travelling from Kandy to Sigiriya – how and how long does it take? 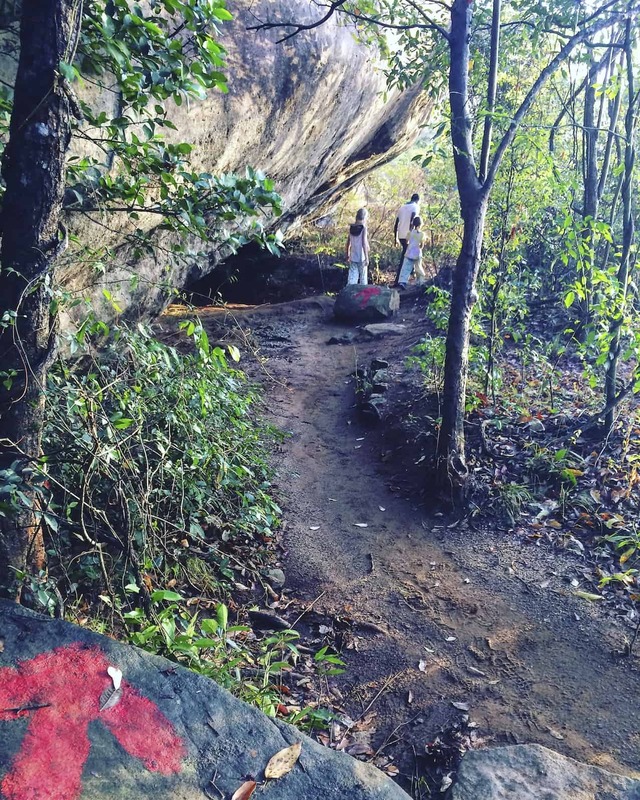 Do I need a guide to climb Pidurangala Rock? 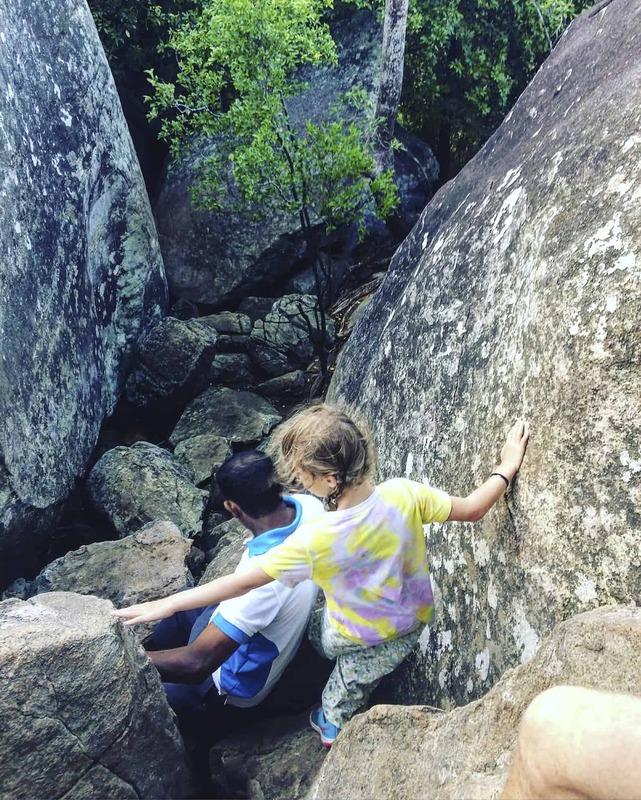 What time of day to climb Pidurangala Rock? 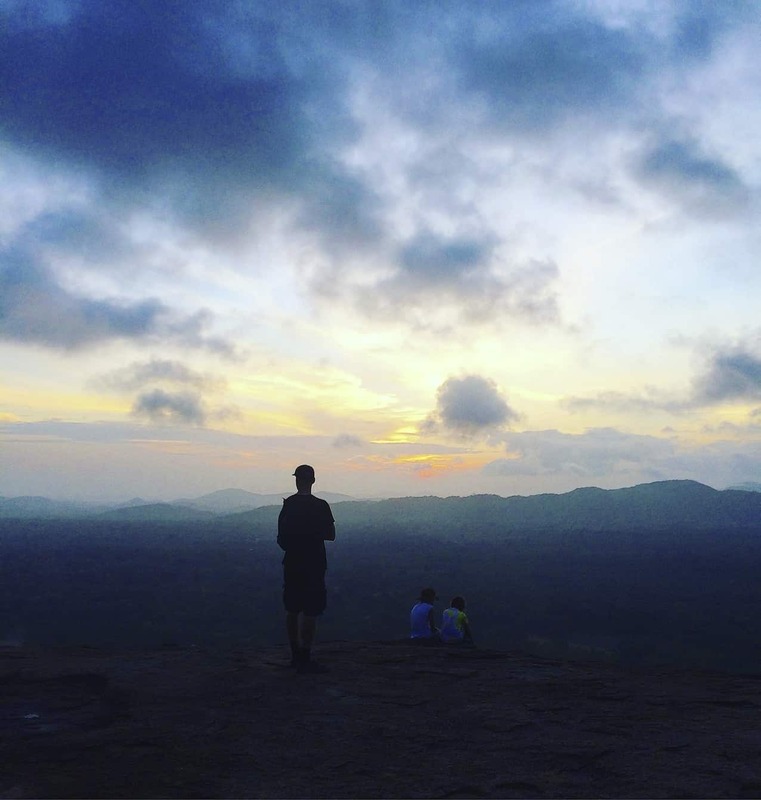 The best time to climb Pidurangala Rock is either sunrise or sunset. We opted for sunrise because the kids would have more energy, it’s cooler AND it’s more exciting setting off in the dark! The last scrabble between boulders before arriving at the top! 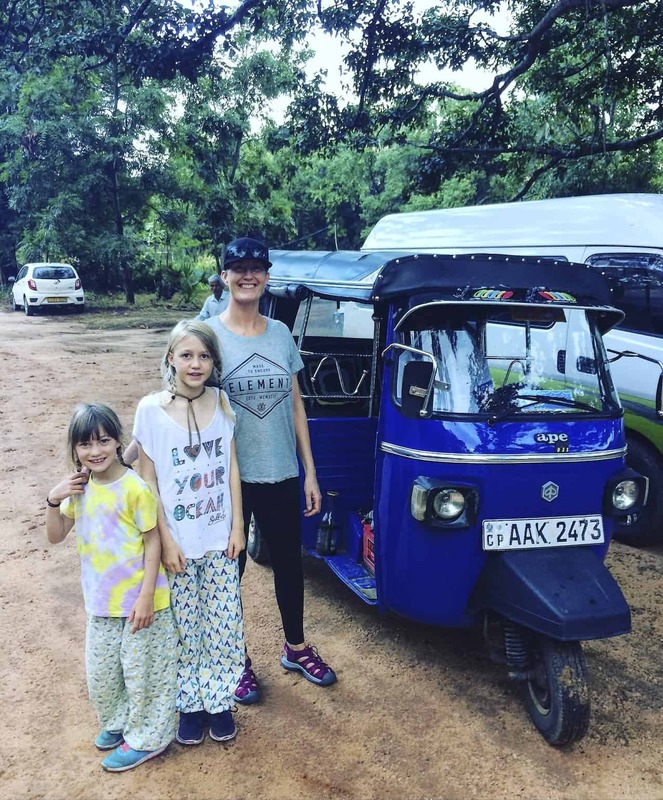 We stayed just outside of Sigiriya in a wonderful homestay, Darnshi Lodge that was inexpensive with wonderful hospitality (and that we would DEFINITELY recommend to any families backpacking Sri Lanka). We set off at 5am catching a ride from the in-house tuk tuk at our accommodation through the jungle to the bottom of Pidurangala Rock. You will need closed toe footwear, no flip flops. Take a strong head torch for every person and water. Our tuk tuk driver came and showed us where to pay the 500 rupee mandatory donation to a sleepy guy in the booth and with head torches switched on, made our way up past the temple’s dark silouette and started climbing the steps. The first section of the climb are steps, steps and more steps – thousands of years old, roughly hewn into the rock. Some are large steps up, but are easy enough to climb, although we needed to stop a few times to get our breath. The path leads you up through the jungle and is covered by trees. 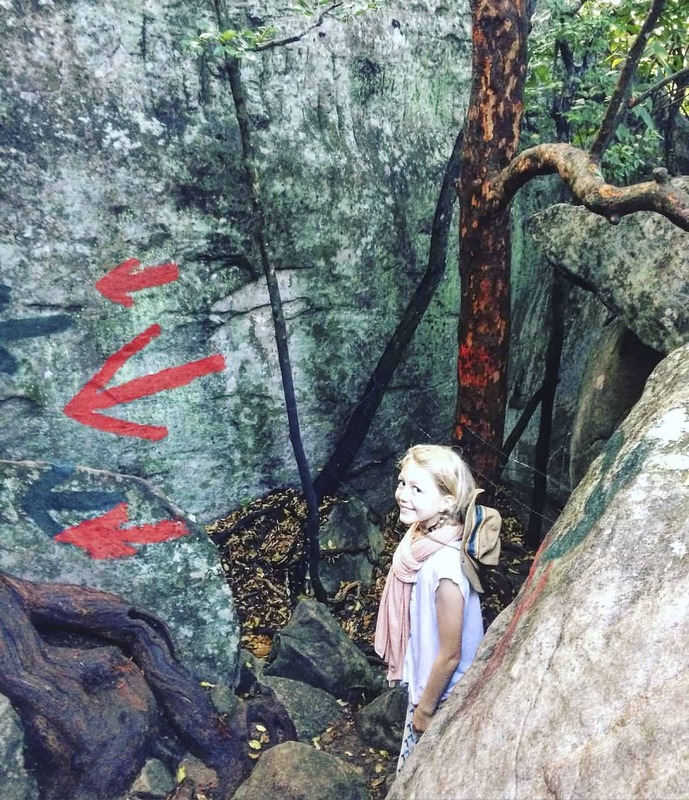 If you decide to climb Pidurangala Rock for sunrise then you’ll be climbing up in complete darkness, basically putting one foot in front of the other up the steps! You’ll be able to see the route more properly on the way down! The second part of the climb starts after the reclining buddha (the site of an old cave temple) but you probably won’t see this in the dark. You can check it out on your return journey. The second stage has no steps (hooray) but the path becomes a little more challenging, because you need to negotiate the path over and in between large boulders. This is the fun part. We took Lonely Planet’s Sri Lankan guidebook on our trip.I’ve used Lonely Planet for years and really rate them. The latest edition Jan 2018 is up to date. Highly recommended. As long as you’re fairly fit and agile, with no mobility issues, it’s not difficult. If you’ve started out in the dark, by this time, although the sun hasn’t yet risen, the darkness is giving way to some light so that helps. Be prepared to push up small children as they will not be able to do it unaided. Kids need a bit of a bottom push on some parts! It took us between 45 minutes to reach the summit. If you haven’t got kids with you and you’re relatively fit and agile, it would probably take you half the time. 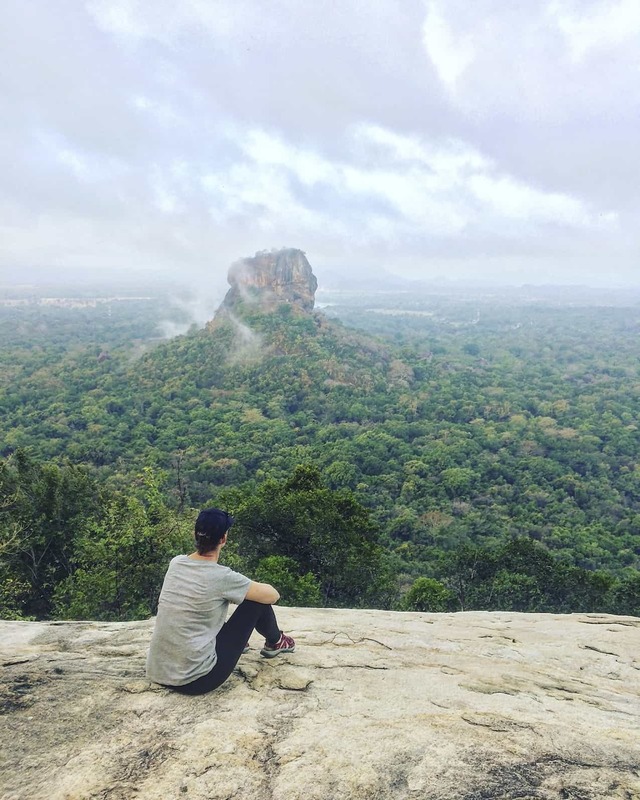 You’ll arrive on the South side of Pidurangala Rock and the very first sight you’ll see is the magnificent ancient rock fortress of Sigiriya towering above the flat lands. It’s probably the most striking and most photographed sight in all of Sri Lanka and the view here is much more spectacular of the view from Lion’s Rock. There’s not much room on the rock shelf here and with a trail of climbers making the climb, you’ll want to take your photos and then climb the last 1 minute clamber up the very top of Pidurangala Rock to watch the sunrise from the East. We were one of the first to climb that morning and so there were only a handful of other people there on our arrival. There are no barriers of any kind at the top which is wonderful. It’s a very natural, wild experience, rather than hoards of tourists. Just be sure to warn your kids not to go near the edge and keep an eye on them. We sat down and quietly watched the sun rise, an explosion of colour suddenly lighting up the land. The swirling mist rising off the land felt mysterious and mystical. It was definitely a moment of quiet contemplation. Like being on the edge of the world! 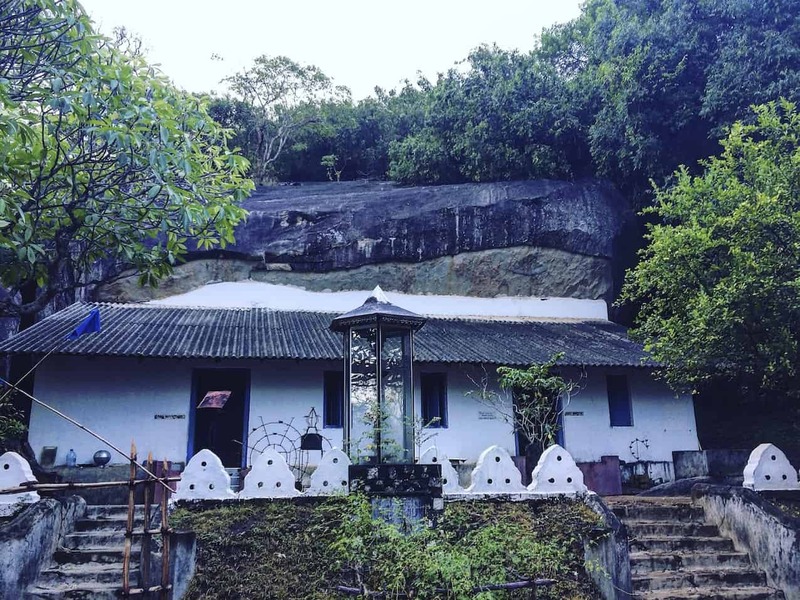 Pidurangala Rock has just as much historical importance as Lions Rock and has been inhabited by monks in the caves on and around the site on and off for the last 2,500 years. Like Lions Rock, Pidurangala Rock was formed by volcanic activity but because of it’s upper surface is steeply sloped and is of solid rock, it was not suitable for any large scale building activity. When King Kasyapa (477-495AD) built the Sigiriya Rock Fortress (Lion’s Rock) he moved the monks that were living around Sigiriya Rock here to Pidurangala where he enlarged the temple and monastery. 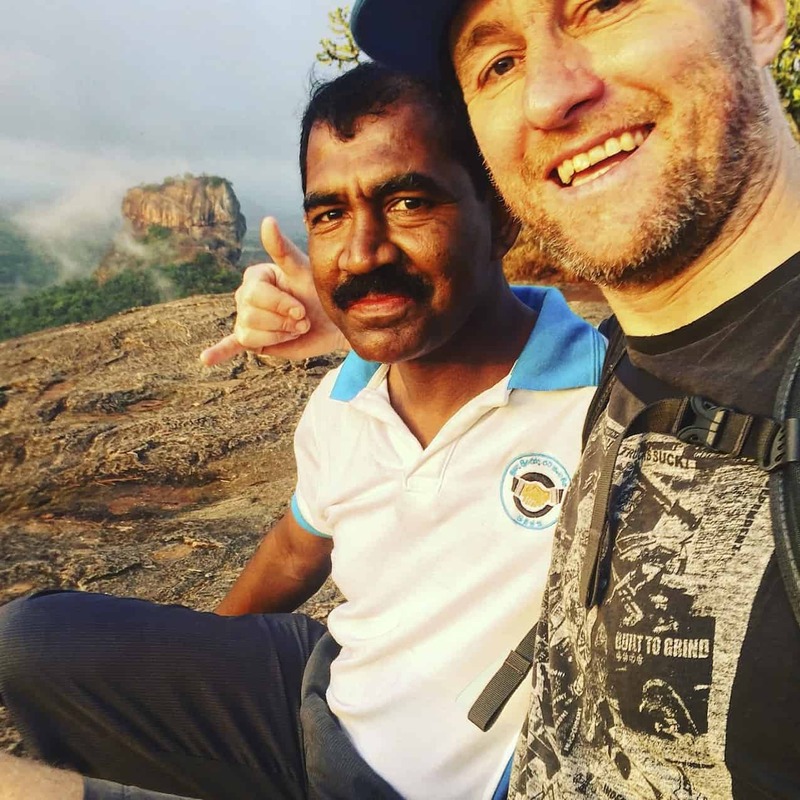 We spent around an hour at the top of Pidurangala Rock before heading back down. By now more and more people had arrived and although it wasn’t anything compared to the hoards of tourists visiting Lions Rock, it felt busy with around 60 or so people up there. 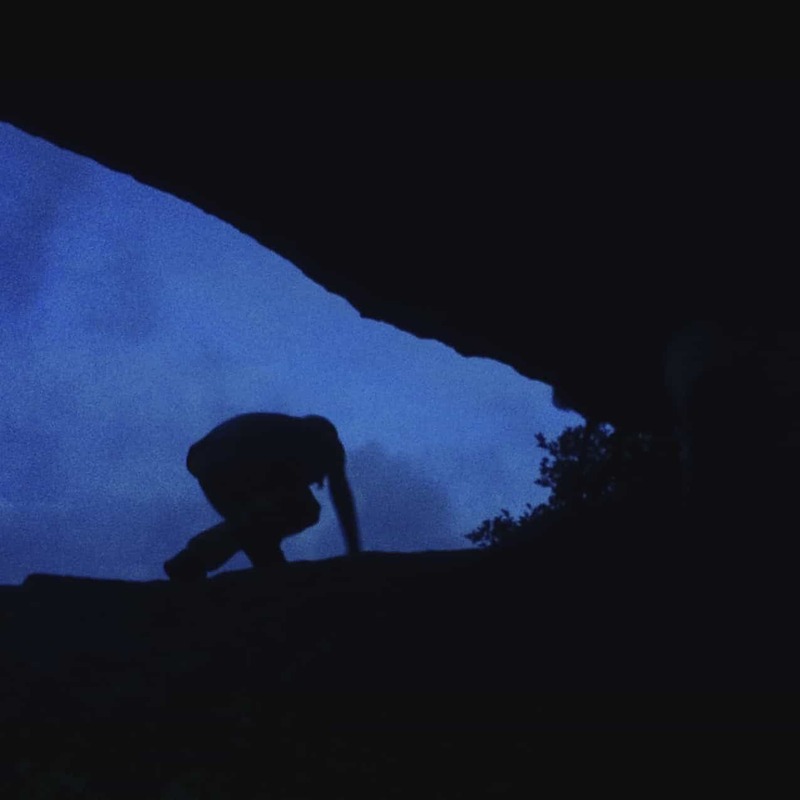 Below is the entrance/exit to the summit of Pidurangala Rock. 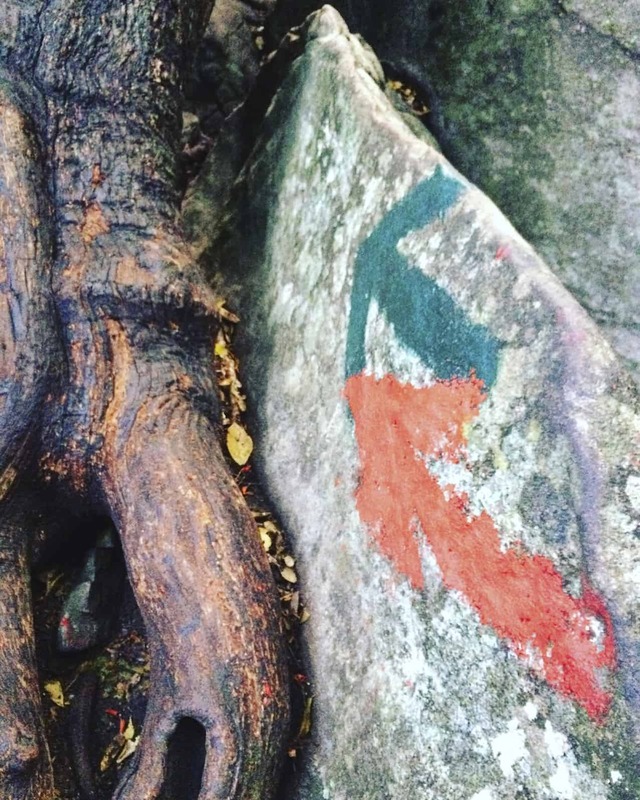 As you can see the boulders are large so it’s not really difficult but anyone with mobility issues would struggle.For adventurous families it’s a walk in the park!Here you can clearly see the painted arrows daubed showing the route. As I said, if you’ve got strong enough headtorches, there is no need for a guide. At least on the descent back you can see! So take it nice and slow and enjoy it on the way back. It only took around 30 minutes to get down. You’ll now be able to see the beautiful reclining buddha lit in all her glory by the morning sunshine. Reaching the temple below you’ll find a hive of activity now. The temple is really just a small room with a shrine. If you enter, remember to have your shoulders covered. I loved this discreet sign by the entrance/exit of Buddha’s last words. And of ganesh’s shrine outside the temple where the tuk tuks park. 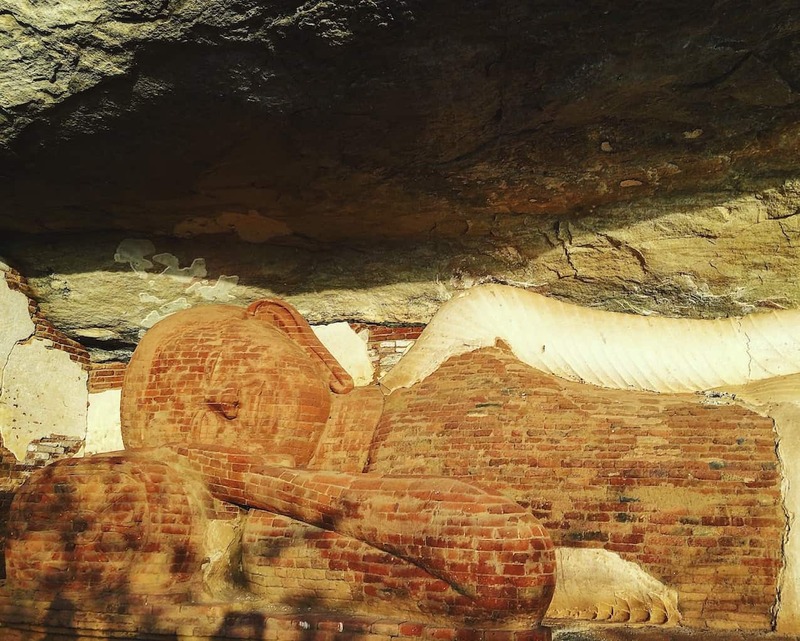 Pidurangala Rock is a few kilometres North of the small town of Sigiriya. Sigiriya is in Sri Lankan’s ‘cultural triangle’, a 2-3 hours drive North of Kandy. Whilst many travellers choose to visit Sigiriya as a day trip from Kandy, we decided to base ourselves in Sigiriya for 3 nights. 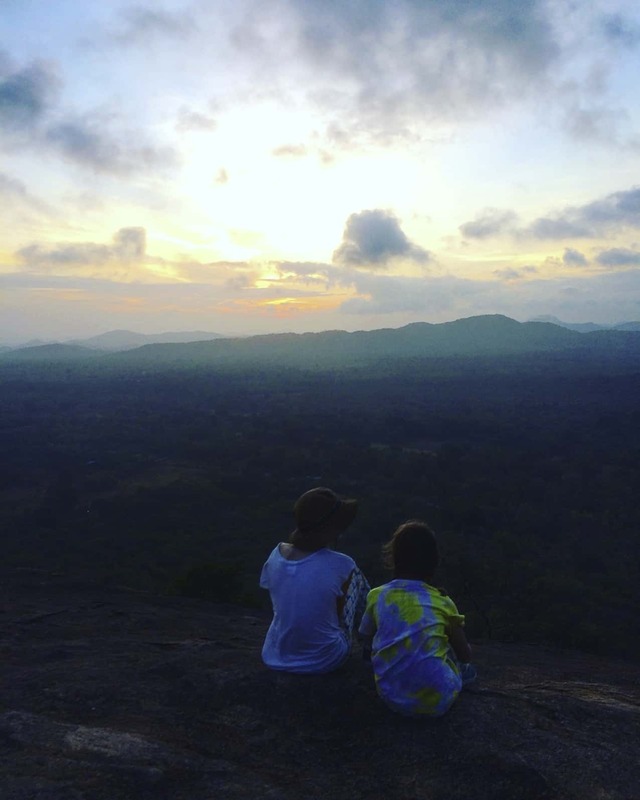 With the kids we’ve found 3 nights is the ideal time to spend in a place unless we’re purely trying to get from A to B.
Sigiryia is the perfect place to explore Pidurangala Rock, the Rock Fortress (Lion’s Rock) if you choose to climb both and to go on safari in Kaudulla National Park to see the largest wild gathering of elephants in the world, known as The Gathering which happens every August. We hired a private driver from Kandy to Sigiriya for 7000 rupees (£32) and it took around 2 and a half hours to get to Dambulla (where we visited the Dambulla Cave Temples) and then a further 20-30 minutes onwards to Sigiriya. It seems that in Sri Lanka no two distances are the same! Many other travellers report longer or shorter distance times but it all depends on the road conditions, the amount of traffic and your driver! In Sri Lanka it takes as long as it takes! Always expect it will take a bit longer than anyone tells you, or you expect yourself! 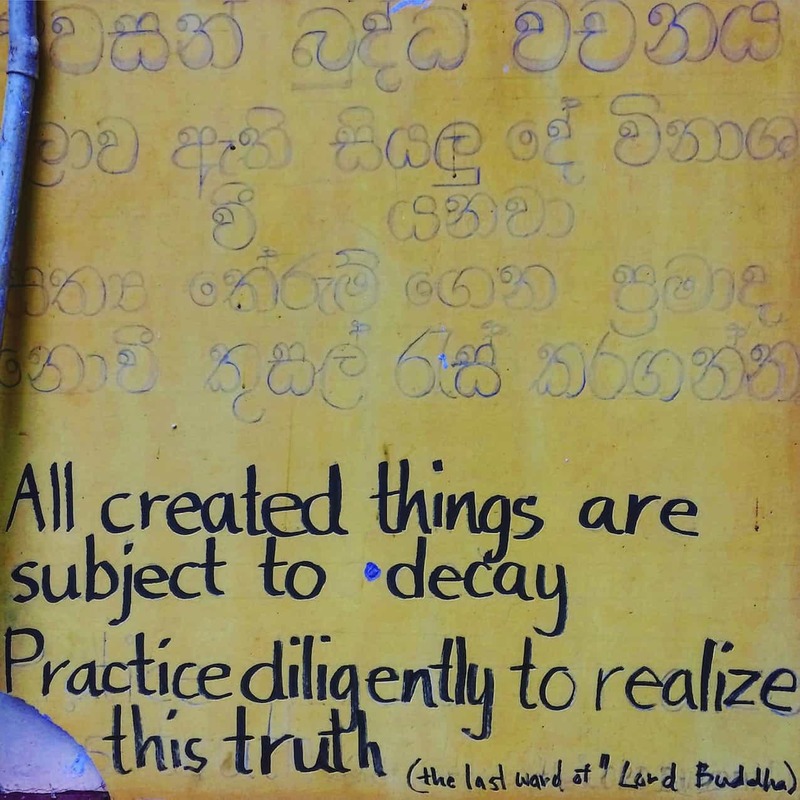 It’s MUCH cheaper to get the bus, but we wanted to spend the morning in Kandy and leave at our convenience, stopping at Dambulla Caves en route. Sigiriya is only 20 minutes on from Dambulla Caves and your driver will wait for you whilst you enter Dambulla Cave Temples. You don’t need a guide to climb Pidurangala Rock but our tuk tuk driver was actually really helpful in helping us negotiate our way up in the dark. Next time though, we wouldn’t use one. Although we didn’t ask him, our tuk tuk driver came with us showing us the way. 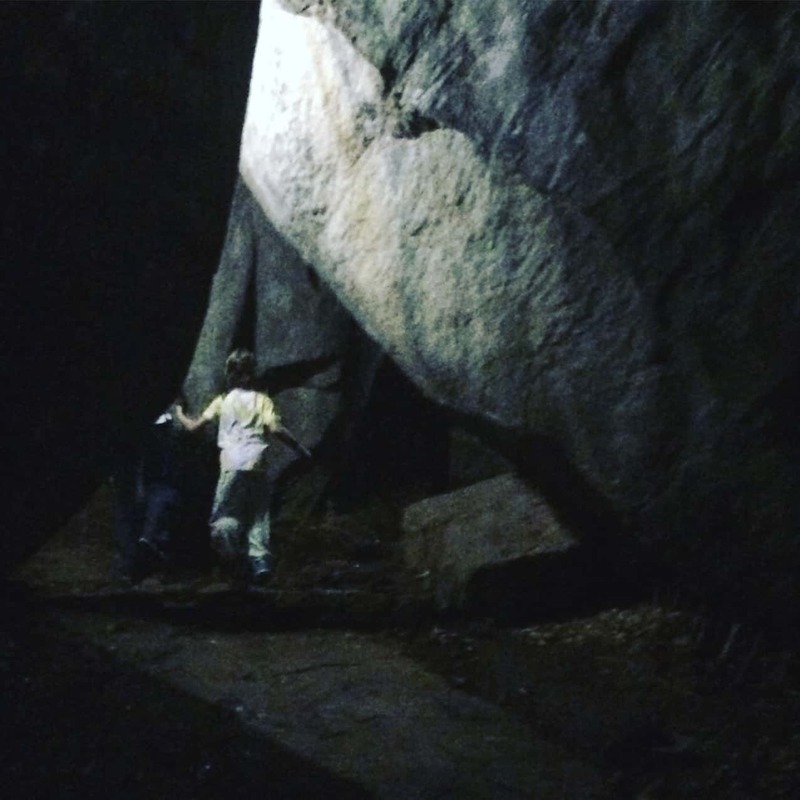 As much as I was was keen to do the climb WITHOUT a guide, it was VERY dark and our head torches seemed rather dim. 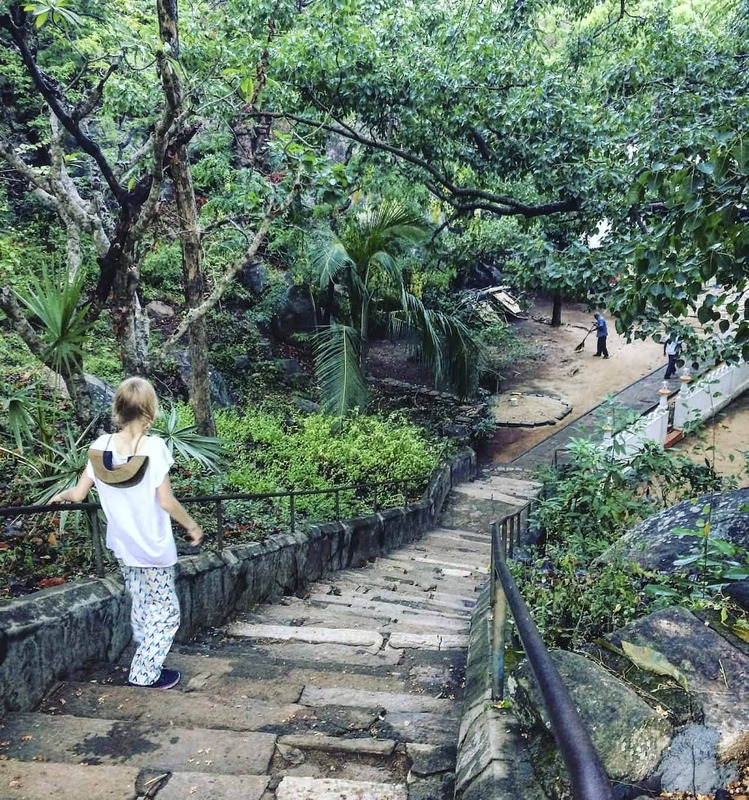 He was also being very helpful with our 6 year old, who can struggle on steps due to her CP (another reason we chose the lesser steps of Pidurangala Rock over Lions Rock!). I wasn’t sure exactly how long the climb would take with kids, so I relaxed and allowed him to lead. In retrospect though, if you’ve got decent head torches with a strong beam, then a guide is absolutely not necessary. The route is well marked with painted arrows. If we did this hike again, we would do it by ourselves no problem. Private drivers are easy to book all over Sri Lanka. Just ask at your accommodation and they can easily arrange a driver, normally for the next morning. We can recommend our driver Pradeep +94 (0) 71 665 4929 who can organise private drivers from locations all over Sri Lanka and charged way less than booking direct through accommodation providers. We used him quite a lot over our month long stay in Sri Lanka. He is also on facebook (Nawaratna Pradeep). These are bog standard private drivers – not luxury! As over all Sri Lanka, be aware that some seat belts might not work, or there might not be any at all. We’ve had rides in cars with damaged seats (not hugely, rather an arm rest broken, or the seat doesn’t go back or the stuffing’s coming out a bit! Nothing major, but don’t expect 5 star treatment! You can read about all of our transport costs, including private drivers in our more comprehensive post Sri Lanka 3 week itinerary. I came across your blog whilst reading about hiking with kids. What an adventure! This sounds amazing, not sure if I’m brave enough to do this in the dark, but it would certainly be an experience you would never forget. We’re considering this over sigiriya next month, but we’ll have our 20 month old with us in a carrier, do you think it would be too difficult with her?